Superstorm Sandy took the mystery out of climate change for this coastal community, but what new challenges are building? 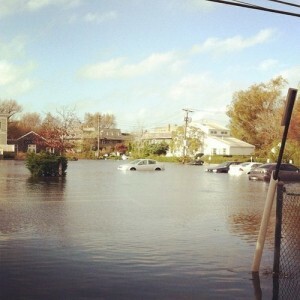 How can East Hampton become more resilient in confronting them? What opportunities are there for the residential community, business and municipal resources to collaborate in a climate action plan? LINDA B. JAMES, M.P.H., is the Garden Club of America’s Conservation Vice Chair for Climate Change. She lectures and writes on raising public awareness of climate change and strategies to encourage actions by local communities in addressing its impacts. As a member of the Town of East Hampton Energy Sustainability Committee, she is actively engaged in developing a plan to implement the Town’s long-term vision of a 100% renewable energy supply by 2020 and a Climate Action Plan. DANIEL BADER is a Research Analyst at Columbia University’s Center for Climate Systems Research. One of his primary responsibilities is developing climate scenarios to be used for adaptation planning. Through his work, Mr. Bader has extensive experience with preparing and communicating climate science information to policymakers, specifically in New York City and State. He has a B.S. in Atmospheric Science from Cornell University and an M.A. in Climate and Society from Columbia University. BRAM GUNTHER is the Chief of Forestry, Horticulture, and Natural Resources for the New York City Parks Department and President of the Natural Areas Conservancy, a new public/private partnership involved in City efforts to conserve and restore thousands of acres of forests and wetlands. He joined the Parks Department in 1991 as an Urban Park Ranger, eventually becoming the Citywide Director before transferring to Central Forestry. In his current position, he creates and executes Parks policy and programs on forestry, horticulture, green infrastructure, and ecological conservation. GORDIAN RAACKE is the Executive Director of Renewable Energy Long Island (RELI). Since 1993, he has been a prominent voice in regional energy issues, and is regarded as a clean energy expert by the regional media, elected officials, and the public. He serves on a number of advisory committees and is a Climate Reality Leadership Corps Mentor, trained by Al Gore. Mr. Raacke holds a degree in civil engineering from Darmstadt University of Applied Sciences. He lives in an energy-efficient and solar-powered home in East Hampton, NY. KIMBERLY SHAW is the Environmental Protection Director of the Town of East Hampton in its Natural Resources Division. She is a former staff member of the East Hampton Town Planning Department and assisted Natural Resources Director Larry Penny in redrawing wetlands boundaries and inspecting properties to see if they required natural resources permits. She also worked on several studies and represented various applications for the town’s Zoning Board of Appeals. She also has worked for the Office of Ecology, a division of the Suffolk County Department of Health Services and was formerly head of the county’s Peconic Estuary Program.